Istanbul is a delightful mix of the Middle East and Europe. I like both places and in Istanbul you get both. The public transportation system is growing. The light rail system below is going thru Sultanahmet Square. It looks nice and seems to operate efficiently. We saw fish in the Basilica Cistern. The Basilica Cistern was originally developed by Justinian in 532 AD. We walked to the sounds of classical music dripping water. We walked up the street from the Basilica Cistern to the Blue Mosque. The Blue Mosque was built during the period of 1609-1616 by the Imperial Architect Mehmet Aga. It caused quite a stir because of its six minarets which rivaled the architecture of Mecca. The building is absolutely beautiful. It is named for the blue Isnik tilework decorating its interior. Not far from the Blue Mosque is the Egyptian obelisk (above and below). It was built in 1500 BC and stood outside Luxor, Egypt until Constantin had it brought to Istanbul. The base it sits on was made in the 4th century AD. Now for our shopping experience. If you have never shopped in a Middle Eastern mall, you are in for some real excitement. We stopped first at the Spice Market. The we left the Spice Market and went a short way to the Grand Bazaar. It is a labyrinth of streets covered by painted vaults and lined by boothlike shops. 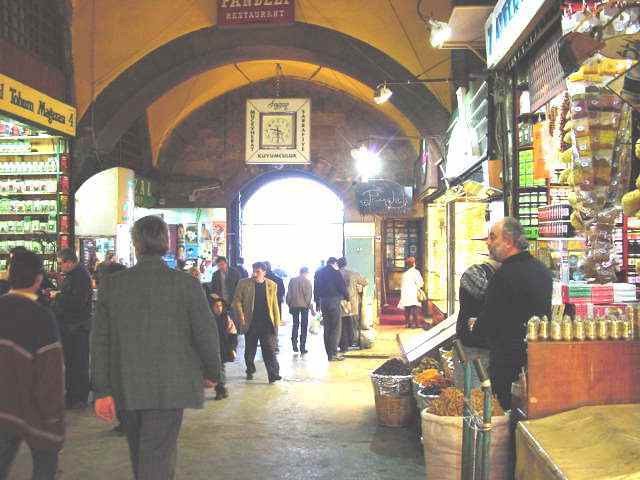 Mehmet II established the Grand Bazaar in 1453 AD. We left the Asian part of Istanbul at noon and traveled back across the Golden Horn to the European side of the city and then headed to the beginning of the Bosphorus Straits near the Black Sea. Crossing the Golden Horn with the Asian side of Istanbul behind us.